Habbox Rare Values, also known as the Rare Values Department or abbreviated as HxRV or RVD, have been a prominent service of Habbox.com since 2004. Habbox Rare Values have been highly regarded by the Habbo community for many years and are attributed as a large part of Habbox's success. The popularity of Habbox Rare Values led to many other fansites attempting to provide their own Rare Values with limited success. Following the merge and the introduction of the Habbo Marketplace the use of Habbox Rare Values diminished significantly. The system was lost with the launch of Habbox.com Version Seven in 2016, but was rebuilt and relaunched in partnership with Ultra Rare Trade in 2018. The role of Rare Values Manager is currently filled by Ozad and the role of Assistant Rare Values Manager by ARGENTINIEN. (Assistant) Rare Values Management The Rare Values Management, currently ozad and ARGENTINIEN, oversee the department and makes sure all of the staff are doing their jobs correctly. They also hire and dismiss any staff while keeping the department running successfully. Senior (Values/Assets) Staff The Senior staff aid junior staff (especially trialists) and will aid the Rare Values Manager when they away - they also help with writing the weekly reports. Values Reporter These people are an integral part of the department – they’re the ones who value furniture and play and important role within the department. Assets Staff These people are better at history, images and research. This is another side to the Values role – they add images and names on the database; it’s their job to ensure everything is updated correctly. Rare Values Advisor They were introduced during the reform by lawrawrrr. They discuss ideas and give feedback on ideas mentioned by management/staff. Competition is very tight for these roles, and the people who fill them are well-respected on Habbo and Habbox for their knowledge when it comes to trading on Habbo, the Rare Values department itself or are just renowned for their good ideas. The Rare Values on the site are dependent on values that have been witnessed within both trades and Marketplace, the team also allow members of Habbox Forum to suggest values if they are incorrect. The senior members in the Rare Values Department are the Head Rare Values Reporters, they approve or deny the updated values given by the Rare Value Reporters. The values can only be edited by the Head Rare Values Reporters and (Assistant) Rare Values Manager. The values are updated as regularly as possible however some new releases will be inaccurate due to them settling into the market. Whilst values for Norms are also provided, the focus is on values for Rares. Rare Values Manager - Mainly run the department, approve/decline values from Rare Values Reporters and delegate to the Head Rare Values Reporters. Assistant Rare Values Manager - Aid and assist the Rare Values Manager in running the department, manage staff permissions. Head Rare Values Reporter - Approve or deny Rare Values Reporters updates, and update values themselves too. Trade Expert - Ask for values to be updated on the site, larger workload than Rare Values Reporters. Rare Values Reporter - Ask for values to be updated on the site (minimum 30 approved per week). Head Rare Values Furni Editor - Edit the furni included on the Habbox Rare Values section of the main site and add new releases etc. Add new categories, including category icons and catalogue headers. Head Rare Values Furni Editors can also work on the values side of the department, by helping to approve or deny Rare Values Reporters updates and by reporting values of their own. Rare Values Furni Editor - Edit the furni included on the Habbox Rare Values section of the main site and add new releases etc. The formal head of the department, writer of staff guides as well as working closely with General Management. The (Assistant) Rare Values Manager is in charge of staff relations as well as writing the weekly/monthly reports for the department. Submit values of their own, Senior Values Staff also aid junior staff (especially trialists) and will aid the Rare Values Manager when he/she is away, and occasionally submit feedback with monthly reports. Values staff are an integral part of the department - they're the ones who value furniture. Some people are better at history, images and research. This is the other side to the Values' role - we couldn't value furni without having the images and names on the database. This role isn't an official staff role and there won't be any specific minimums, although they will be expected to contribute to the reforms. All new staff who join the Rare Values department will be given a trial normally lasting 2 weeks, after this time they'll be a fully fledged RV member of staff, given they've passed their trial. The Department was inaugurated in 2004 and is marked by the date that K@Boom was hired as the 1ˢᵗ Rare Values Manager by Habbox Owner sierk. In 2006 the Department was rocked by mass resignations - over half the department - and public outcry concerning the events of the Samovar Crisis which led to rival sites such as Vodor.net and HHGS taking a slice of Habbox's market share. Habbox Rare Values ultimately recovered by 2008 and are still here to this day. During 2006 and 2007 (and again in 2013-2014) a popular article series was written as a joint venture between the Habbox Articles Department and the Rare Values Department entitled Rare Values Weekly. Like the now-abolished Rare Watch Editor role, this was technically separate to HxRV. In 2010 Sulake introduced the Marketplace which dramatically changed how items on the hotel were traded. Formerly, the only way to value an item was to check the value on Habbox, know it yourself from experience/friends or to look at a rival rare values site other than Habbox. From this point onwards, the strong influence and sway the Rare Values Department and Habbox held on rare values was broken forever. In the July of 2014, the Department turned 10 years old and this was marked by major changes to the staff roles which required reforming after a decade of virtually no changes despite the many taking place on Habbo Hotel itself. The creation of a permanent Coat of Arms (above) for the department as a symbol of the role of the department as well as the history of the department to celebrate a decade of Habbox Rare Values was commissioned and designed by the then-Rare Values Manager -:Undertaker:- and created by then-Graphics staff Jurv. From 2015 to 2016 the Rare Values Department fell, for the first time in its history, under the direct control of Habbox General Management while the system was under development. There have thus far been, as of late 2017, 21 Rare Values Managers, 22 Assistant Rare Values Managers and many hundreds of members of staff. 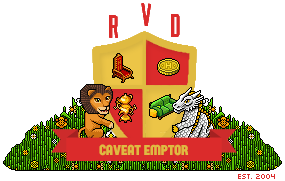 The Rare Values Department is over 14 years old (as of late 2018) making it one of the oldest departments on Habbox. The birthday of the department is recognised as the date which the inaugural Rare Values Manager K@Boom was hired. Immenseman, Mr-Trainor and -:Undertaker:- have each held the managerial position a record three times, with -Danube- and Samanfa each holding it twice. In terms of combined reigns, -:Undertaker:- has served the longest period of time as Rare Values Manager; a grand total of 535 days. Mr-Trainor has served as Rare Values Manager for 503 days in total, with DJ_Shadow at 432 days. In terms of combined reigns, -:Undertaker:- has served the longest period of time as Assistant Rare Values Manager; a grand total of 280 days. Samanfa has served as Assistant Rare Values Manager for 217 days, with Netaxes at 213 days. Mr-Trainor has been the only person to hold the Head Rare Values Furni Editor role in the department. lawrawrrr and welshcake became the first and thus far only acting Rare Values Managers in 2015 and 2016. Out of both, welshcake has served the longest in an acting capacity with a reign of 388 days which came to an end in August 2016. This page was last edited on 15 February 2019, at 03:00.